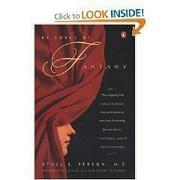  The role of fantasy in personal and cultural evolution, explored in depth by an erudite psychiatrist (Columbia Univ. Medical School) who draws not only on her own patients' histories and the psychoanalytic literature, but from world history and literature. Person's interest in fantasy arose from her work on romantic love (Dreams of Love and Fateful Encounters, 1988) and deepened as she began to see how fantasy influences all human relationships. In her words, ``We enact aspects of our fantasies not only in our personal relationships but in the choices we makethe goals we aspire to, the paths we follow, the overall tone and content of the voyage we make from birth to death.'' Person examines various kinds of fantasies: repeating fantasies, which persist from childhood into adulthood; generative fantasies, which unfold over time; fantasies shared by two people; and borrowed fantasies, that is, ones drawn from the culture at large, often from fiction, but also from real life. Her discussion of borrowed fantasies, which focuses on two themes, suicide and violence, includes a timely look at the role of paramilitary fantasies in the formation of fanatic sects. Person concludes with an examination of how shared and borrowed fantasies influence the way a whole culture is shaped. The examples she chooses range from the establishment of a Jewish homeland to the French Revolution to the topic that triggered her initial interest in fantasy: the rise of romantic love in Western culture. The book ends on a somber note, for Person, citing as example the Aryan fantasy of the Superman that pervaded Nazism, warns that ``fantasy is to cultural evolution as mutation is to biological evolution, and cultural mutations, like biological mutations, may benefit us, but they may also kill us.'' A mind-stretching inquiry into the hidden but decidedly powerful world of daydreams.